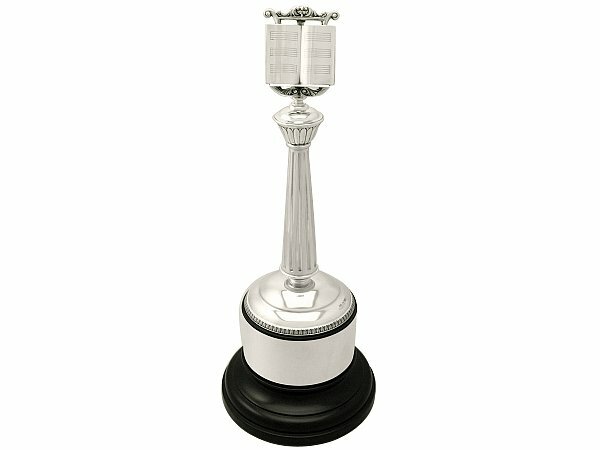 This fine vintage George VI sterling silver trophy has been realistically modelled in the form of a music stand. The unusual upper terminal of the silver trophy is in the form of a classical lyre style music rack ornamented with chased scroll and leaf decoration and accented with an open book of sheet music with blank staves. The upper portion of the column has a plain conical shaped knop encircled with a band of chased elongated stylised petal motifs. The cylindrical tapering column is embellished with vertical bands of concave fluted decoration. The rim of the domed circular spreading base is encircled with an applied stylised leaf and dart decorated border. 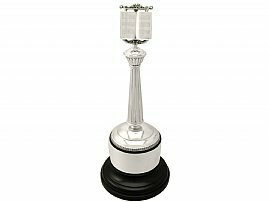 This fine vintage silver music stand trophy retains the original, large and impressive cylindrical ebonised wood plinth, with a domed spreading base and encircled with a deep vacant silver inscription band; the band may be engraved with a personal inscription if so desired. This impressive trophy is fitted with an internal dowel pin which provides a concealed attachment to the plinth. This vintage silver music stand trophy is an exceptional gauge of silver, fine quality and in exceptional condition. This impressive example of George VI silverware has been professionally polished and is in presentation condition. Full hallmarks struck to the surface of the base are all very clear. Width of music rack 6.8cm/2.6"
Diameter of silver base 11.8cm/4.6"